Computer Architechs International Corporation (CAI) along with its VeloceventTM Event App sponsored the BizBash LA Live 2015 Event Planners Choice Awards at the Bizbash Los Angeles Live 2015 Event at the Los Angeles Convention Center on June 24, 2015. 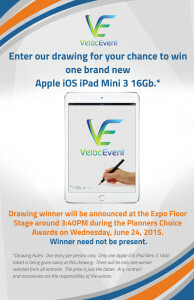 At the Event Planners Choice Awards CAI announced the winner for the drawing of the Apple iOS iPad Mini 3. CAI also exhibited at the event at Booth 510 showcasing the latest release of its Velocevent Event App, the Enterprise Grade Event App for any size event.